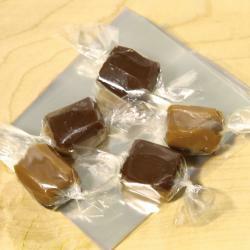 These cello candy wrappers provide a great solution for all of your chocolate and caramel wrapping needs. They are the "CLEAR" choice - with a robust size of 4" X 4 1/2"
These Clear Cello Wrappers are the PERFECT choice for your caramel goodies! Caramel won't stick and the wrapper holds it's twisted shape.